As a consultant who has facilitated hundreds of brainstorming sessions for associations and other not-for-profit organizations, I found the information from this book review fascinating. "Brainstorming" has become a byword for tedium and frustration. Because what they really want to know is how: How do you actually generate novel ideas and do so consistently, on demand? 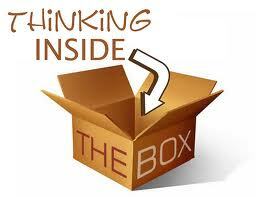 We advocate a radically different approach: thinking inside the proverbial box, not outside of it. People are at their most creative when they focus on the internal aspects of a situation or problem—and when they constrain their options rather than broaden them. Consider a contact lens, an exercise bicycle, a package of powdered soup and an ATM. What do they have in common? They have all had something subtracted. Subtract the frame of a pair of glasses and you have the contact lens. Remove a bike's rear wheel and you invent the exercise bicycle. Extract water from soup to make a package of powdered soup. Take the bank employee out of a cash transaction and you have an ATM. Bring together unrelated tasks or functions. Copy a component and then alter it. Separate the components of a product or service and rearrange them. Make the attributes of a product change in response to changes in another attribute or in the surrounding environment. Using any one or all of these "inside the box" techniques involves retraining the way your brain thinks about problem solving. Most people think innovation starts with establishing a well-defined problem and then thinking of solutions. Our method is just the opposite: We take an abstract, conceptual solution and find a problem that it can solve. This approach to innovation was first described in 1992 by the psychologist Ronald Finke. He discovered that people are actually better at searching for benefits for given configurations (starting with a solution) than at finding the best configuration for a given benefit (starting with the problem). The key to being consistently innovative is to create a new form for something familiar and then to find a function it can perform. Excerpted from The Wall Street Journal (6/14-15/13) which was adapted from “Inside the Box: A Proven System of Creativity for Breakthrough Results” by Boyd and Goldenberg.